FAST!! 90cc 4 Stroke, Single Cylinder, Air Cooled Engine, keeps engine temperatures reliably under control, even while idling at stoplights--for maximum efficiency and longer engine life. 3 speed Semi-Auto (no clutch) Transmission Extremely easy for beginners to get start. Front and Rear Drum Brakes Powerful and durable drum brake allow you to slow down or stop quick and steady. Kick start convenient and easy to handle. High-Tensile Steel Frame: much heavier than others, very strong and cannot be broken easily. Wheel: 10" Front and Rear off-road Tire, More Traction! DB-W012 is the best dirt bike you could get in the market for less than $700. This bike was designed by experts and perfect for beginners. 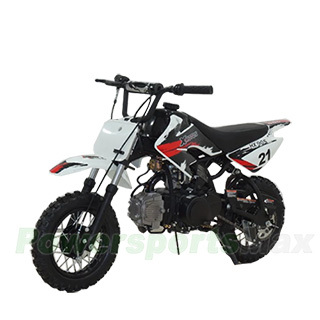 Our 90cc dirt bikes are the ultimate in competition racing bikes that have a high performance 90cc 4-stroke engine with 3 speed Semi-Auto transmission and Kick start, extremely easy for beginners to get start. High-Tensile Steel Frame much heavier, stronger and cannot be broken easily. We paid great attention to the balance of our dirt bikes. Front fork, suspensions and tires are special designed and tested. You will have smooth and comfort ride experience with our balanced bikes! As any rider would tell you, power is nothing without good brakes. The DB-W012 again comes with class leading front and rear Drum brake, allow you to slow down or stop quick and steady. There are other well-engineered touches through out the bike, oversized pegs, rubber handle grip, long comfort seat etc. We stock all parts for DB-W012 from manufacturer directly, any problem or any need, simply give us a call and we will service you promptly. Just enjoy and have fun, DB-W012 is the ultimate dirt bike in its class! Your Expert Choice! Shipping charge for one single unit of DB-W012 is $199.95(Please login to see real shipping charge for these states: Florida, New York, District of Columbia, Connecticut, Maine, Maryland, Massachusetts, Montana, New Hampshire, New Jersey, Pennsylvania, Rhode Island, Vermont, West Virginia, Delaware, etc.) , and you will get discounted shipping price if you order multiple item. We bought this for my son on his birthday. He loves riding it around the neighborhood and has taken it into the bicycle trails by our house. My wife, too, has taken it around the block a few times. They both have a blast with it. This was for our granddaughter. She love's it. All is working fine and it was shipped in a timely fashion. Thank you!!!! Kids love this. Pretty quick for an motorized item. I was a little worried that the battery time wouldn't last as long as it should. My son gets plenty of ride time and the bike goes just fast enough for him. He has played with it often and there has been no problems. He really loves it. Purchased for my son for Christmas- he loves it. So far has rode very often and we have had no problems. Very happy with purchase. Everything has been great so far, got it quickly and put together farly easily. He loved it if it would just warm up enough to ride it outside! Kids love this. Pretty quick for an motorized item. ..